GUILFORD, Conn. (WTNH) — In just a few short months, I’ll be taking a trip down the aisle, and like most brides, I want to look and feel my best when I say “I do.” That’s why I turned to plastic and reconstructive surgeon Beth Collins, M.D., to see how I can freshen up without going under the knife. Dr. Collins and I met to come up with a game plan, targeting three of the areas that will get the most visibility on my wedding day and honeymoon. First up: My face and chest. As a kid and even as a young adult, I was no stranger to the sun, and its effects are catching up with me now. Thankfully, Dr. Collins recommended using her brand new laser machine, which uses different wavelengths to tackle everything from brown spots to hair removal to sagging skin. For the red and brown spots on my chest, Dr. Collins used the broadband light, or “BBL” laser setting. It works by gently heating the upper layers of skin, stimulating the cells to generate new collagen. The procedure makes the spots on my chest temporarily darker but in the next week or so, they’ll flake off to reveal glowing skin. For my face, Dr. Collins used a combination of BBL and the Halo laser. The Halo combines two treatments that in the past were performed separately. One laser targets the top layer of skin while another removes years of sun damage from deep within. The effect will continue to get better over time. Next up are my hands. To get rid of my unwanted pigment spots, Dr. Collins also used the Halo laser. The last area Dr. Collins targeted were my legs. “On my honeymoon, we’re going to Hawaii, we’re going to be in bathing suits,” I told Dr. Collins. This amazing machine can even tackle spider veins. I watched as they seemed to disappear before my eyes. It’ll take a few weeks to see the full effect from the laser procedures, but after today, I’m definitely on my way to being a blushing bride. 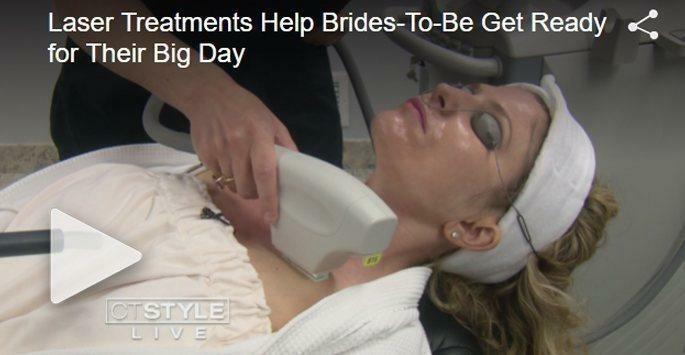 If you’re planning on getting a laser treatment before your big day, Dr. Collins recommends doing it at least a few months before you walk down the aisle. For more information, log on to BethCollinsMD.com.